With over 25 years in the scaffolding industry, Apex Scaffolding have a wealth of experience with new build properties. From commerical sites through to individual self builds, safety is our highest priority and we provide a professional Trained and Accredited Workforce. Persimmon Homes - Scaffolding for new build of approx 110 plots on brownfield sites at Fleetwood and Preston, Lancashire. Islamic Seminary, Bradford - New build scaffolding for steel frame building. Kensington Developments - Scaffolding for new development of housing estate featuring detached properties and apartments at Lytham Quays on the Fylde Coast. Jones Contracts / Orbit Office Suites - New development of 5 large brick-built 3 storey office blocks at Middlebrook, Bolton. 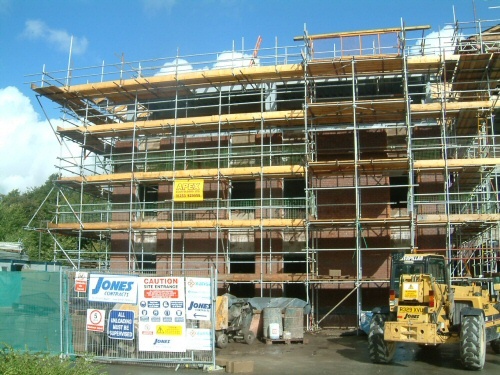 To enquire about our new build scaffolding, please email or give us a call.